It stormed a bit more last night and then was clear the rest of the night. Since we were down in a meadow, there was condensation and I was care not to touch the beads of water on the ceiling of my tent as I packed up. My sleeping bag and other things were ok and that was a relief. We started hiking at 6:37am and the clouds were clear. It was a great cool morning. 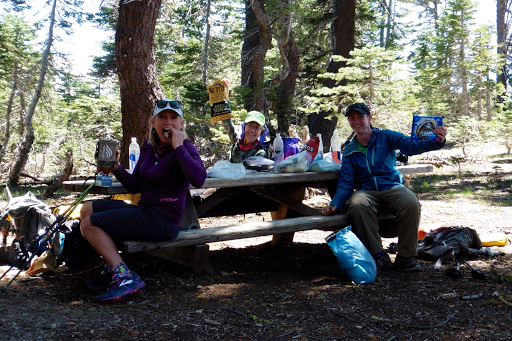 We were all excited to reach the junction with the PCT in a few miles. 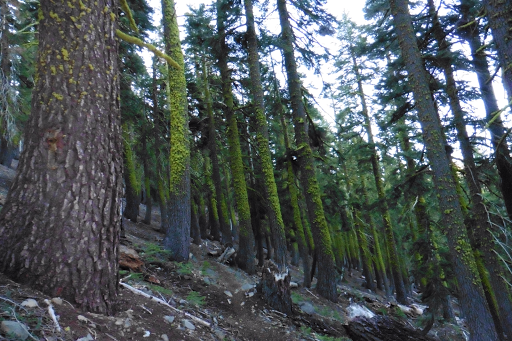 Before that, was the junction to summit Twin Peaks, which you can see pictured above our campsite last night. It was only a quarter mile off on a side trail and looked like fun(and I’m an identical twin! ), so we dropped out packs and scrambled on up and spent the better part of an hour on it. A great side summit and I highly recommend it! 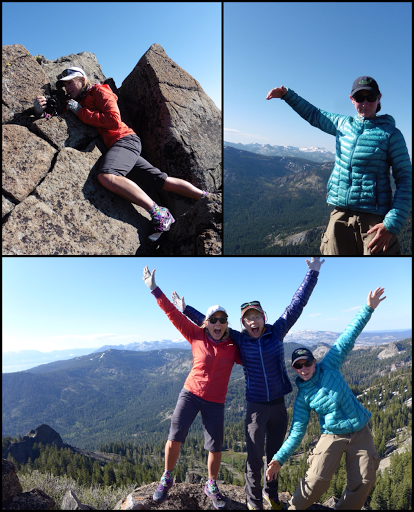 Here are photos of Rockin setting up our summit shot, the three of us with the background of where we are headed, and me with my twin sister. Twin Peaks with Lake Tahoe in the background . 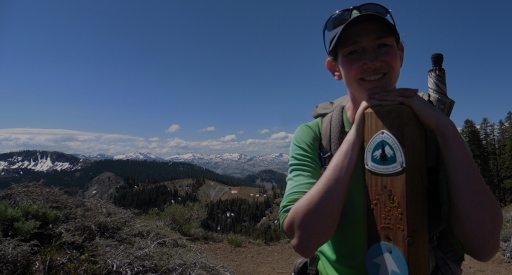 We returned to the trail and returned HOME to the PCT! 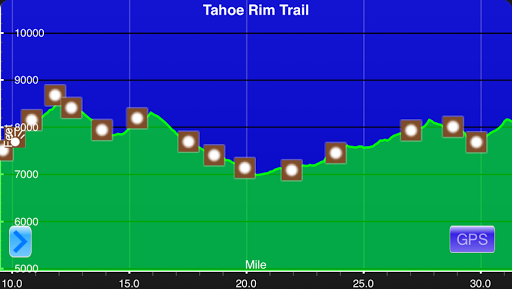 The TRT overlaps with the PCT for the next 50mi. 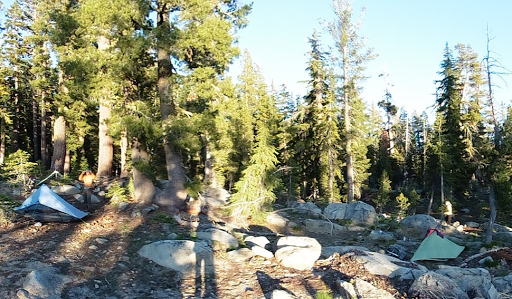 Even though today isn’t one of the most memorable parts of the PCT, it was still wonderful to be back on a trail that has brought me such bliss. It really does feel like home to me. 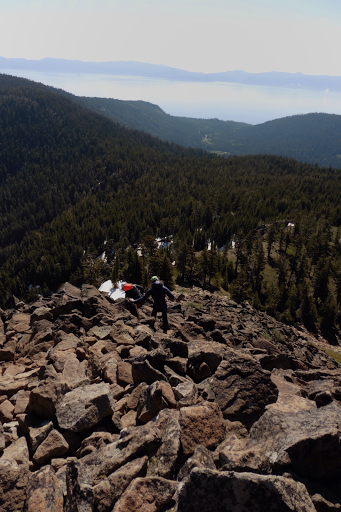 For a short bit before we descended, there were some great ridge walks with Lake Tahoe in the distance. 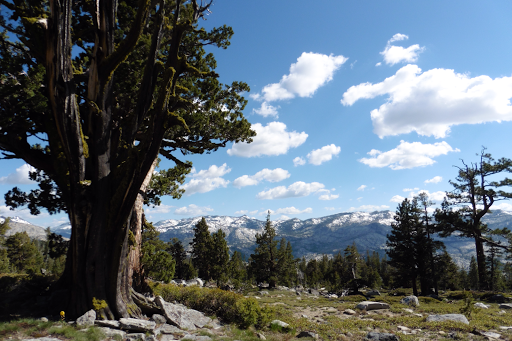 Much of the day was in the woods as we headed toward the most remote part of the TRT, Desolation Wilderness. We had lunch at Barker Pass where there were some picnic tables. Having picnic tables at lunch is decadent and we really enjoyed it. We also dried out our tents and anything that was wet from last night. 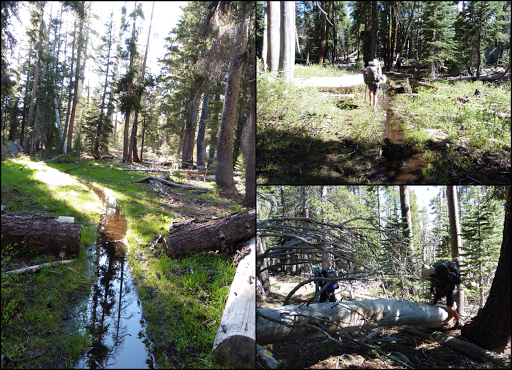 One of the fun parts about hiking sections of the PCT again is what we each recall from the other times we came though. When we sat down for lunch, I thought it felt familiar. Then it hit me that I had lunch at that table, and as I was leaving, Drop-N-Roll and Ninja arrived. 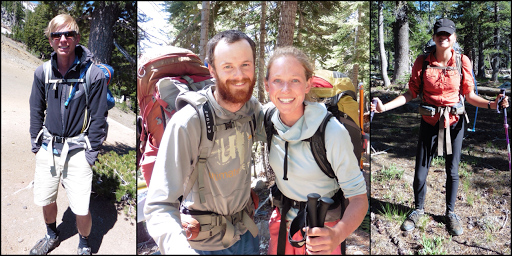 I didn’t known them well on the PCT, but did camp where they did the night before. Those that followed my CDT journal know that we became better friends after the hike when Drop-N-Roll moved to Portland and they were part of the group that I hiked the first 1/3 of the CDT with. Just fun to remember some of our first meetings and interactions. I also had fun seeing where I had camped with them. Really brings up the flashbacks and now I have two fun memories of lunch at Barker Pass. As we got further into Desolation, the mosquitoes got more aggressive, but we’re fine as long as you were moving. As soon as we stopped, they swarmed, but thankfully, they are the ones that are slower to bite. 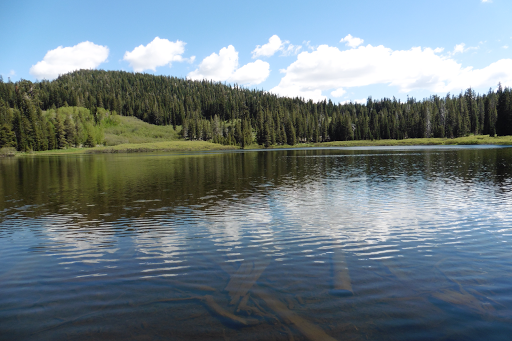 We did get one nice lake (Richardson) and a brief stretch with a great view of the Crystal range. We got water and had the game plan of hiking higher to hopefully get out of the marsh and mosquitoes. We hiked a bit later til 7pm and did find a nice drier area with a bit of a view. There were still mosquitoes. They weren’t terrible, but it was enough to wear a head net and gloves to be fully covered. Why Not and I couldn’t take them and had our dinners in our tent. They at least cleared out after it got dark. We got to watch a nice sunset from our tents through the trees and the sky had nice orange, red, and purple colors. It was a sunset that was nice in person, but not stellar on a photo. Tomorrow will be a fun day with some memorable scenic locations, some hiking in snow over Dicks Pass, and hopefully dinner at Echo Lakes where a friend may meet us, yay! 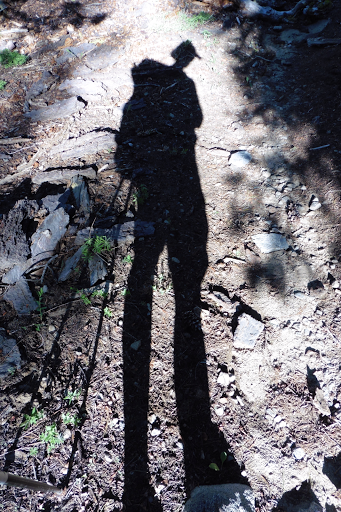 This final photo is in memory of my shadow photos I took on the PCT in 2011. Ah, the memories…it’s good to be HOME!